All Hitchcock films are scavenger hunts of symbolism and macguffins, but The Birds is the Gospel of effectively using sound in horror. Bernard Hermann was hired as the composer but he didn’t write any music for the film, rather Hitchcock asked him to focus on incorporating noises and strategic silence that make the birds more menacing and the scenario more dire. Alfred Hitchcock’s films are idolized, but the director himself was a bit of a Norman Bates who had various phobias (eggs, policemen, his mother, etc.) and creepily obsessed over the blonde leads in his films, including Tippi Hedren from The Birds. The only Barbie I need! 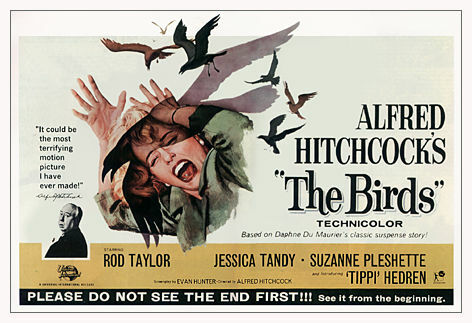 YES there is an AWESOMELY TERRIBLE sequel to The Birds. It was a TV Movie from 1994. I remember watching it as a kid!